Michał Jan Ciesielski | Quantum Trio “Duality: Particles & Waves” Premiere! 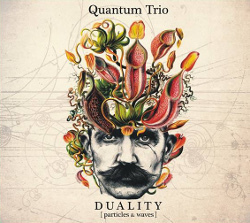 During this year’s Jazz Jantar Festival, on 16th March 2017 Quantum Trio will perform a premiere of their newest album “Duality: Particles & Waves“. PARTICLES – the world that is tangible. The acoustic sound of the instruments – grand piano, saxophone and drums. Energetic, polyrhythmic tunes are mixed with calm yet intense ballads. The rhythm becomes the keynote of the whole album, joining both parts together. WAVES – the alternative reality. The world, where matter and energy interweave with each other. Tunes that escape from unequivocal definition, inspired by punk, ambient, electronic music or post-rock achievements. The album was recorded in October 2016 at the E-Sound Studio in Weesp (next to Amsterdam, The Netherlands) by Michal Ciesielski. The album was produced and mixed by Michal Ciesielski and Kamil Zawislak at the Nei Gong Studio in Gdansk. The album has been mastered by Marek Romanowski. The cover art has been designed by Jaroslaw Świerczek (KARTON Studios). Photos by Mira Sałyga. The Album has been released by Nei Gong Music label.